To read the story of Our Lady of Chicago in Albanian, please click here. Miracles ... certainly we believe in them, for they are so much a part of our Orthodox Christian heritage. The Gospels are filled with accounts of them. Yet who among us would ever expect to witness something “miraculous” happening right before our eyes? As strongly as we claim to believe in the miracles of the past, just as strongly would we doubt their occurrence today in the 21st century. They just don’t happen now ... not in Chicago, Illinois. The parishioners of St. Nicholas Albanian Orthodox Church in Chicago all must have had a similar attitude prior to December 6, 1986. But something happened that morning that not only changed their feelings, but changed their lives as well. Something happened that has had a profound effect on the millions of people who have since shared in the spiritual experience that began to unfold that day. It was then that the now-famous Icon of the Theotokos began to weep. This article will not attempt to offer any scientific explanations for this phenomenon, nor will it try to provide a theological interpretation of why the Virgin shed tears. Who could possibly state with certainty what God’s purpose is for giving us this miraculous sign? It is the sole purpose of the author to merely document this most incredible story from the point of view of one who has been blessed and privileged to witness firsthand many of the miraculous aspects of this event. On December 6, 1986, the Very Reverend Archimandrite Philip Koufos arrived at his church with a good feeling in his heart. His three-year pastorate at the 250-family parish of St. Nicholas on Chicago’s northwest side was beginning to bear fruit. He was pleased with the noticeable spiritual renewal and rebirth his congregation was undergoing. 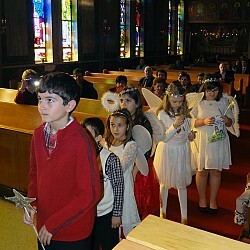 The church had been quite full the night before for Vespers on the eve of the Holy Day of St. Nicholas the Wonderworker. He anticipated the same response today, as the parish celebrated its patronal feast. Lillian George and Bessie Tolbert, two dedicated parishioners, had also arrived at the church well in advance of the start of services to make some last-minute preparations. As Father Philip lit the candles burning in the lamps before the icons on the ornate icon screen, he reflected upon the sermon he had preached the previous evening. In his homily, Father Philip extolled the many virtues of St. Nicholas, concentrating on his role as a worker of miracles and as a healer. He spoke about the great responsibility of today’s clergy to be “healers” as well. Father’s thoughts were interrupted, however, as he began to light the candle burning before the Icon of the Blessed Virgin Mary. What were these wet streaks on the icon? Puzzled, he was about to call out to Lillian and Bessie, thinking that someone had perhaps inadvertently splashed something on this holy image of the Mother of God, when he glanced up and gazed into the eyes of the Theotokos depicted before him. In an instant, he knew that the moisture on the icon was not caused by any cleaning mishap. Tears were actually welling in the eyes of the Virgin. After staring at this sight in speechless wonder for a few seconds, Father Philip was able to compose himself and get the attention of the two women, who were now in the back of the church. They hurriedly approached the sanctuary, where they, too, stood totally awestruck before the sacred image of the Mother of God. If this were not enough for the astonished trio to comprehend, moisture began to spout from the fingers of the Virgin, causing Father Philip to fall prostrate before the Holy Icon. According to an ancient tradition of the Church, this style of icon of the Blessed Mother is traced back to an original painting of her done by the Evangelist Luke. It is said that the Theotokos herself gave her blessing to this portrait, saying, “My blessing will always remain with this icon.” St. Luke is said to have sent this icon, along with the text of his Gospel, to Theophilus in Antioch. In the middle of the 5th century, this holy image was taken to the city of Constantinople by the Empress Eudoxia, as a gift to her mother-in-law Pulcheria. It was in the 9th century that the name “Hodigitria” began to be used in reference to this special painting. In the reproduction of this icon, the Christ Child always appears seated upright on His Mother’s left arm. The Infant is no longer shown as a baby, but rather as the Pre-Eternal God, full of wisdom. He holds a scroll in His left hand, and is shown giving a blessing with His right hand. The Mother of God is portrayed in a majestic manner. Her right hand is pointing to her Son, in a grand gesture of presentation. It is as if she is proclaiming to mankind that his Child is the Son of God, the One we must follow and obey. Since December 6, 1986, it has been estimated that more than 2 million people have come to St. Nicholas Church to view the Weeping Icon. Orthodox hierarchs representing nearly all the jurisdictions in the United States have humbly knelt in prayer before the Miraculous Lady. The Weeping Icon has reached out and touched the lives of more than the hierarchs and dignitaries of the Orthodox Church. Pilgrims from all walks of life, of all ages, and of all faiths have visited and returned again to this modest Albanian parish to view the miraculous sign. They come for a variety of reasons. Some come out of curiosity. Others come looking for miracles in their own lives. Still others come merely to pray and meditate before the Icon of the Mother of God. Groups from all over North America have come to share in the wonder of this miraculous sign. Father Philip and his parish have hosted groups from all over the United States and abroad. At times, the crowds have been overwhelming, yet the members of this specially blessed congregation have continued to warmly welcome everyone who enters their church to share in the spiritual joy that this Icon has brought to so many. In September 1988, moisture was noticed on the face of the Holy Virgin and remained visible for almost two weeks. On July 23, 1995, the Holy Icon began to weep copiously as she had originally on December 6, 1986. And for the hungry, their food. And to the orphaned, an aid. Save your servants from their sin, we ask you. To read the various newspaper articles that were written regarding this miraculous sign please click on the individual dates below.